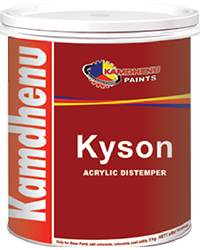 Kyson Acrylic Distemper specially formulated acrylic copolymer emulsion based distemper for elegant, smooth, durable, matt for interiors. It gives wall a delightful, attractive matt finish that lasts for ages. 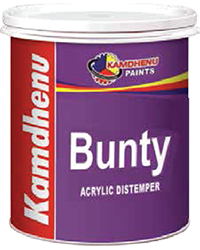 If you are looking for an economical yet durable wall paint your search ends at Bunty Acrylic Distemper. It is specially formulated water based interior wall paint which retains the brightness of the all for a longer duration. 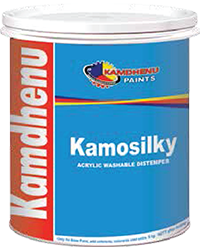 It brings smooth and matt finish to your home and can be tinted with Kamo universal Stainer to obtain customized shades.